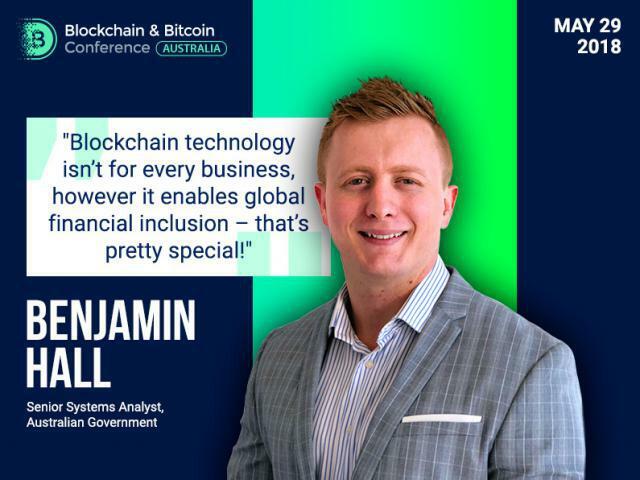 Blockchain has brought two important changes: global remittance and global financial inclusion, believes Benjamin Hall, ETHLEND Australian Ambassador. Benjamin Hall is the technology and innovation expert. He will be a speaker at the Blockchain & Bitcoin Conference Australia on May 29, talking about the payment modernization and fintech organizations. In the interview, Benjamin Hall explained discussed changes in financial services and Australian blockchain regulations. BCA: What do you think about blockchain regulations? Are they positive or negative? BH: In my opinion, regulations are a must. There are always positive and negative sides of that. But to ensure consumer adoption and trust in this technology, it is certainly something that is needed because from the positive side of things, it keeps away scams, Ponzi schemes and multilevel marketing schemes. But obviously from the negative side, what consumers and businesses are finding at the moment or what they’re worried about more is whether it’s gonna be overarching, is it gonna be overreaching? Is it something that is gonna stifle the innovation of the technology? So, a lot of individuals currently are finding that they are not sure what the taxation implication will be for them in the cryptocurrency space. A lot of individuals aren’t sure of how to best go about running an ICO. Are they, you know, in line with a consumer or corporation’s act? Are they aligned with how ASIC sees a business running that asset particular security within this country? So, as long as we get the education right, leading up to regulatory body changes or new laws and adoption, it must take place. We are very well-placed here in Australia to ensure that the marketplace and the technology thrive. And then, I think it’s evident in the fact that Australia actually had experience of common speak back to 2014, I should say, via a conference link to the Australian government to explain how regulation is important but not to cut down a very nice technology and to ensure that it’s allowed to evolve and grow. So, moving forward as a nation, we have something to look forward to. BCA: What important changes have financial services seen with the introduction of blockchain? BH: I think these are probably two main important changes that have been brought about by distributed ledger, or blockchain technology in our financial sphere to date. The first of all is global remittance. So, what we are finding is that, you know… global remittance has $40 bn every year. And it’s a long process while banks transfer from one to another using your money to hopefully prop up their own bottom line. However, this obviously is something that consumers simply don’t like. They want to transfer that money but they also want to do it for a low fee. Now, with blockchain technology, bitcoin or otherwise, we’re seeing large sums of money. Not only individuals but also businesses or financial institutions are able to use it. Transactions in the billions and cents are being able to transfer across the world in seconds for such low fees. So, that’s incredibly important – moving forward. The second thing and one of my favorite things is global financial inclusion. So, what we’re finding is that individuals who live in areas which may be unbanked or derisked because of the sheer cost for financial institutions are to provide know your customer information and to run those particular checks to determine credit worthiness. They can now be included in these marketplaces. They may not have a bank account, but they have a mobile phone to may have the technology to be able to use decentralized landing platforms like ETHLend or also use any form of financial tooling which is made possible by distributed ledger technology. BCA: Are there many financial products/operations that are yet to integrate the technology? BH: I’d say there is a large number of financial products that haven’t been integrated with blockchain. And the reasons for that are: banks and financial institutions have been looking for blockchain technology ever since it popped up. They know that the monolithic systems are slow and expensive in many ways, and they follow any opportunity to improve their business processes and certainly something they’re investing in. However, you’ll need to ask yourself as a business anywhere in the world whether blockchain technology is correct or right for you. Is it removing intermediaries? Is it something that you can actually store digital asset over a record of that digital asset? Because if it’s not one of those two things, moving forward with blockchain possibly isn’t the best solution for you because you might actually have a trust problem that needs to be solved. So, yes, certainly, financial operations or products that aren’t included yet, do they need to be? Well, only time will tell. BCA: Australia recently introduced regulation for cryptocurrency exchanges, what are your thoughts? BH: The cryptocurrency regulations that we’ve seen are not different to that of financial institutions. Even car dealership in their reporting obligations to AUSTRAC. And that’s simple. Any money laundering hinders financing. Regulations are to ensure that individuals and groups transacting large sums of money who could be performing unfair acts are scrutinized. Now, if you are not doing anything wrong, you don’t need to have anything to worry about. However, individuals are finding that the premise of the original vision of Satoshi Nakamoto and distributed ledger technology is being stepped on by such regulations. Because it stops them from being able to be anonymous online and to use services like Living Room of Satoshi to pay bills, to get the money from crypto and back to fiat or to even pay the ITO. So, I think what we’ll find is that it will slow down adoption for some period of time because individuals feel like that trust barrier… they are being scrutinized, looked at. You know, individual parties that aren’t conducting, you know, fair business. However, it’s something that was always going to happen, so the nation and every other country around the world are doing the exact same thing. So, what is part and parcel of the industry we’re in – so far, so good. All these exchanges from CoinSpot, CoinJar, Independent Reserve, BTC markets are all complying, signing up, doing their due diligence as a part of this process and hopefully will have a thriving economy to go with it into the future. Interact with the speaker and find out more about different sides of blockchain regulations at the conference!